the variables are overwhelming for most average shooters...still interesting to discuss though. For my chrono info listed in a post here the temp was 45F, altitude 4600. The altitude alone reduces air friction and increases velocity as atmospheric pressure at that elevation is about 12.4 psi. Are my findings of higher velocity than box labels attributed to the elevation? Longer or shorter barrel than the lab model, chamber fit to account for gas leaks..etc. Without a like test from the same barrel at a different altitude and same ammo lot for comparison its hard to say...maybe someone else here understands more than I do. Air temp will effect powder burn efficiency and pressure curve, and of course barrel length is thrown in there. Too much for me...at 50-150 yards the science does not need to be that perfect...just an understanding of one's own equipment and a good trajectory chart and range finder for the off chance of a longer shot than 'dead-on' hold is good enough for me. I have chrono'd my Savage 93R BTVS with a Magneto Speed V3 and they was higher than advertised. I haven't chrono'd my Ruger American Target with an 18 inch barrel yet and I plan to do so along with my Garrow upper. My plan is to chrono all 3 using the same lot numbers and try to find atleast 5 with same exact rim thickness to chrono to see if the SD improves. I would presume a 20-30 fps+- drop in velocity per inch lost can be expected? 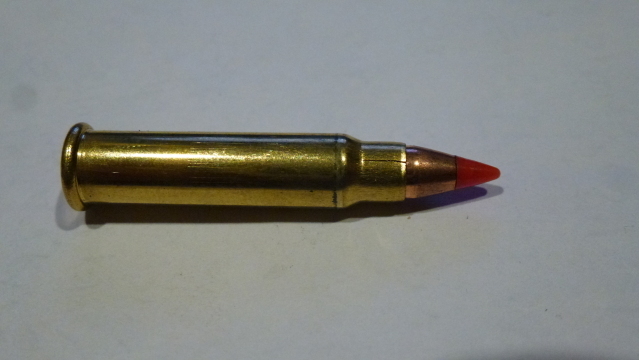 For what it's worth, I've shot over 22,000 rounds of 17hmr over the last 9 years, and have never had a single spit case. Never found one in a box, and never after it's been shot. I only shot one box of Winchester, and they would barley chamber in my Anschutz's, and were hard to extract. Really complete crap. Makes me wonder how tight some rifles chambers are. Rifles are a Volquartesn Fusion semi-auto, a pair of Anschutz 1717's, and a Anschutz 1727F. Seems to me that people have either a poor chambered gun or maybe its older ammo and brittle but none the less they like to blame the ammo never the gun. Splits as frequent as mentioned above would have me questioning the gun. I've never been around what I considered a great hmr that had cz on the side either. I agree with the chamber statement and TNT ammo in most hmrs for accuracy. The volquartsen is a good choice too. My brother and I mainly shoot 17hmr's from 3 different manufacturers without a split case. We mostly shoot Hornady 20 grain XTP's, CCI FMJ's and Federal Vshok TNT's. Scott...all three of those labels are CCI products. Last edited by jaia; 03-24-2019 at 01:34 PM. It is not just one brand over the years either. That un-fired split 17....any communication with CCI?...curious about their response both as a public relations nightmare and as any technical answer they may have offered. Nope, not worth the effort. One out of five hundred. Used it to obtain a peek inside and look at the components. Slight difference in the powder texture, smaller granules from the last time I pulled one apart. The rest looked as expected. Brass hardness varies depending on the supplier. I read they neck down after priming and can't anneal with primer in the case. Work hardening occurs and cracks happen. Last edited by jaia; 03-26-2019 at 10:32 AM.